This article was provided by Richard Viberg, Ed Bowes and Art Clowes to tell the story of the Sunset dining train at the Salem and Hillsborough Railroad. They provided the majority of the photos, and I included a few of my exterior photos. 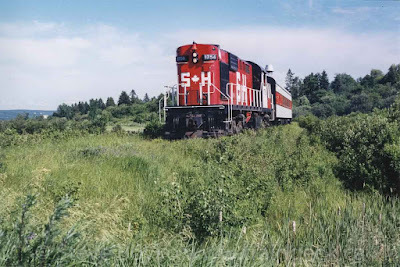 CN 1754 at the head of a dinner train at Salem, NB. Steve Boyko photo. 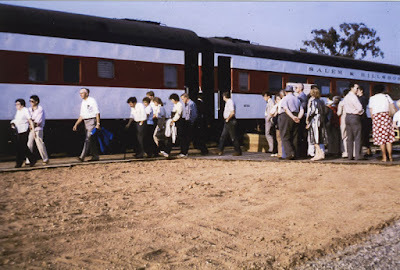 During the winter of 1985, in order to increase the revenue at the railroad, management put together a proposed Dinner Train service to accomplish this task. 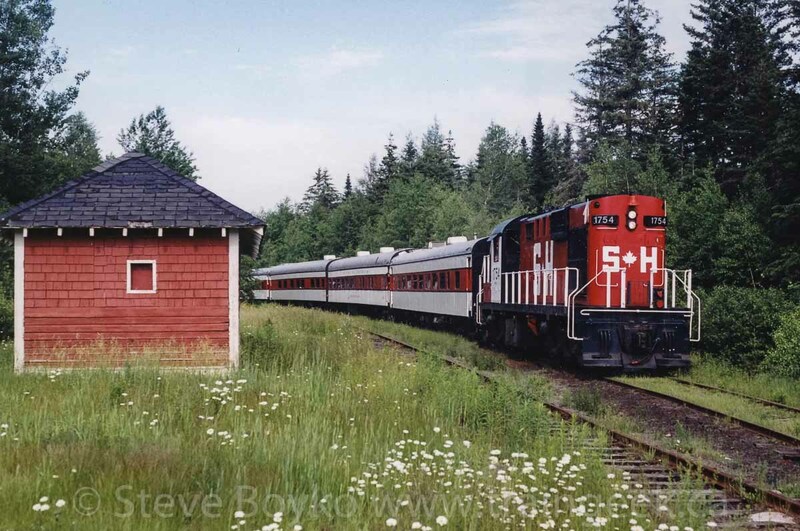 As we had two empty CN / VIA 5400 series passenger coaches, one was considered most suitable for conversion into a dining car (ex VIA 5433-Ed.). A proposal was put together, submitted and approved with a provision that funding for the capital improvements had to come from external sources. 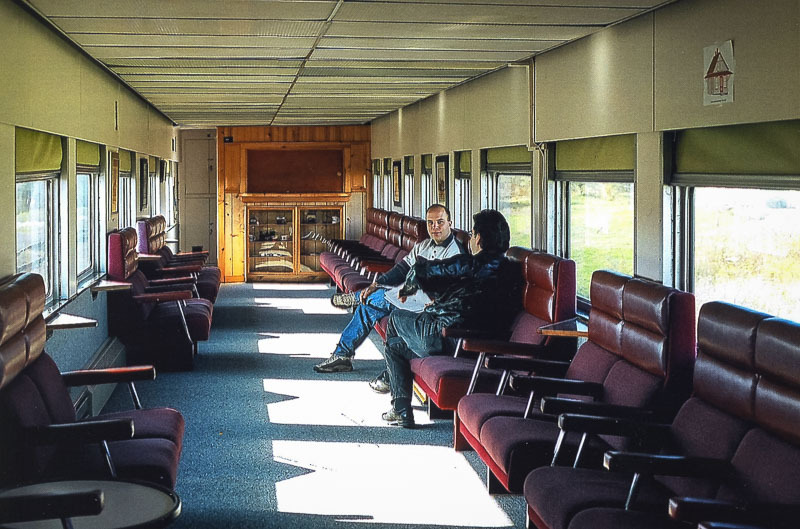 During late April 1985, the selected coach was moved to an area close to the maintenance shop in order to start a clean up in the interior and begin the retrofit into a dining car. A partition that divided the former passenger smoking area was removed and re-located to the proposed kitchen area. At the men's wash room everything was removed in order to install a commercial propane Bar-B-Q and a steam table. Counters were installed on both sides of the aisle for storage of dishes and linens. Overhead racks were built to store all of the glassware. In the dining area the overhead baggage racks were removed. New carpeting was installed along with twelve former dining tables at each window providing seating for 48 persons. Each table had a white tablecloth, two blue runners, napkins, silverware, glasses and a vase of fresh cut flowers. The interior was painted in a pale blue colour. 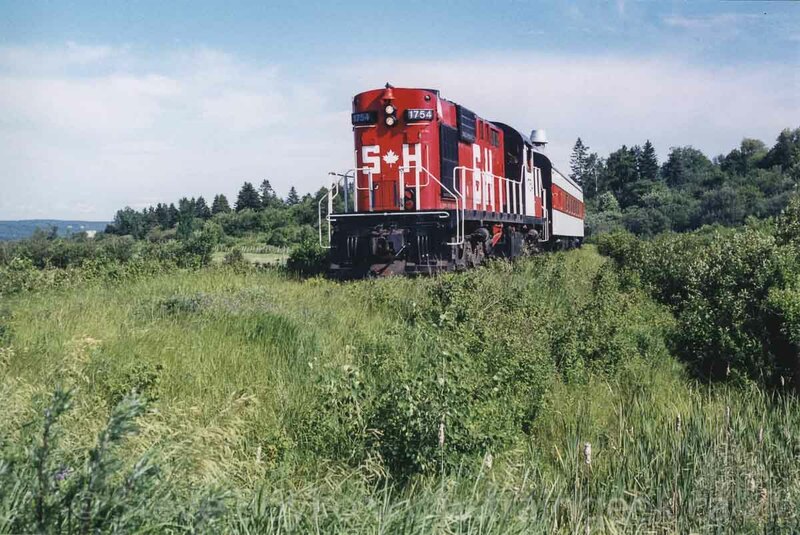 Unfortunately there was no air conditioning, and to provide electric power in the kitchen and lights for the lounge car, we secured two small gas generators. During the mid stop over at Pine Glen Road to reverse for the direction home, we refueled both generators before leaving. Your four course dinner included a choice of apple or tomato juice, a tossed garden salad, warm rolls with butter and a main course choice of roast beef, steak, lobster or surf and turf served with mashed or baked potatoes, fresh garden vegetables and a choice of a slice of freshly baked pie served with hot tea or coffee. A few days before our first dinner run, we realized we had forgotten about chairs for our dining passengers, so we quickly made arrangements with a hotel in Moncton to borrow 48 convention chairs for the season. 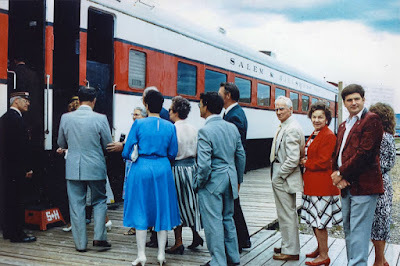 The final task was to clean and paint the exterior of the new dining car white with red and black trim. Saturday July 20th, 1985 was the very first run with 48 invited guests of the Village of Hillsborough, with twelve other booked passengers. 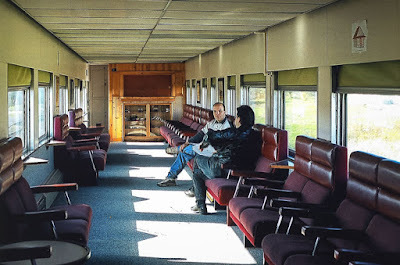 The train was pulled by RS1 #8208, with dining car "Sunset", lounge car 1000 "Valley View" and an open air car. Departure was set for 6:15 PM for the 2 1/2 hour trip. However, the train did not depart until 7 PM due to electrical problems with the kitchen roof exhaust fan. The dining crew consisted of Chef Peter Fullerton, Kitchen Assistant Katherine Meyers and waitresses Catherine Wissink and Debbie Meyers. As the first year was experimental, a maximum of 60 passengers were accommodated in two sittings. Other than the paid on board staff, the operating train personnel were volunteers. The dishes and final clean up had to be carried out after each trip, once the train was shut down and all of the crew fed supper. Loading the train. Ed Bowes is at far left. The dinner train operated on Saturdays and Sundays until late October, showing a very small operating profit for the first season. 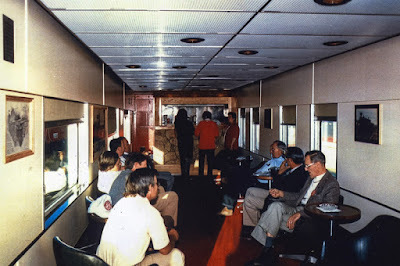 During the spring of 1986, several major upgrades were carried out on the dining train. A propane hot water heater along with a new dishwasher and a cooler-refrigerator were installed in the kitchen. The dining area received new side drapes beside each window. Six electric floor heaters were installed for the cooler off season. The chairs borrowed the first season were returned and new ones purchased. We built a food services building to store bulk food items in freezers along with a new ice cube machine. We also received a stove to pre-cook items for the on-board kitchen, especially during the busy fall season. In order to reduce the interior heat in both the diner and lounge car, each roof was painted silver and two rooftop air conditioners were added. This helped reduce the overall temperature by about 20 degrees during the warm summer months. To power these improvements, a 12 kV diesel generator was placed under the diner to handle the additional electrical load. We also added one of the excursion coaches to accommodate the increased load of passengers. This allowed for one sitting departing and a second sitting before returning from a 3 1/2 hour extended return trip. 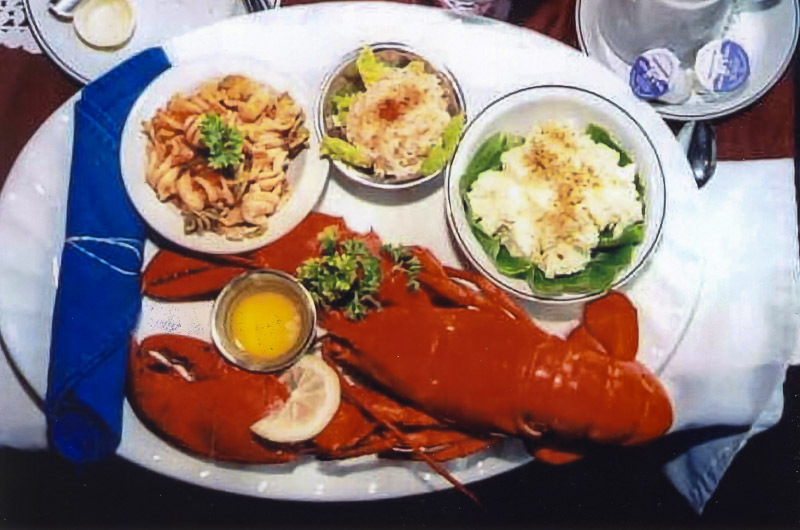 The dinner train operated mid-week and on weekends from mid May to September. During October, turkey dinners were featured for the main course along with pumpkin pie. The fall foliage was at its peak and we operated at 100% capacity. 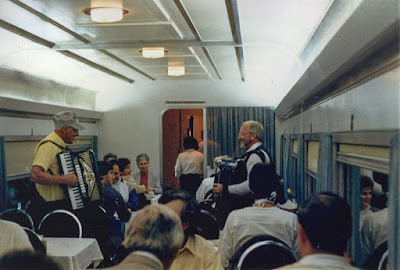 During 1987 another lounge car 1002 - "Mountain View" - was added to the consist and set up back to back with the first lounge car so the live on board musical entertainment could be heard in both lounges. We also built a table in each lounge for a punch bowl and trays of cheese and crackers. 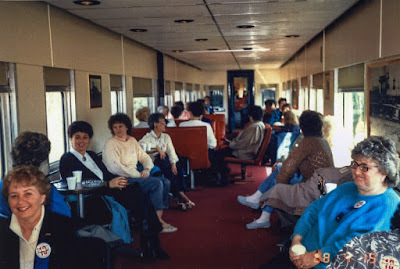 As passengers moved to the lounge cars after each of the two sittings in the dining car, additional coffee or tea was available. Another 12 kV generator and two more air conditioners were installed for added passenger comfort. 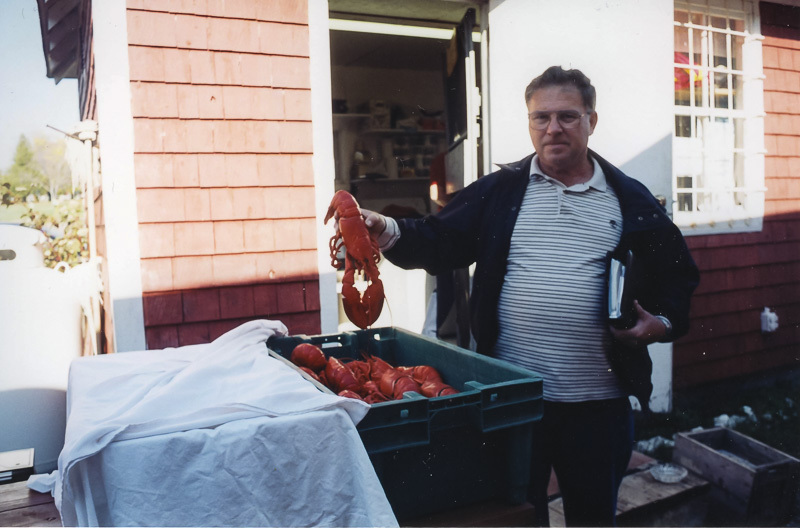 During the spring of 1988, a new propane stove and microwave oven were installed in the kitchen. The second empty coach 5433 was converted into a party car and named "Le Bistro". This car occasionally was used as a table car for extra meal seating. The train consist now had four cars, allowing for excellent braking on the downhill portion of the trip between Baltimore and Salem as the rest of the trip was reasonably flat until the last 1/4 mile uphill into Hillsborough. 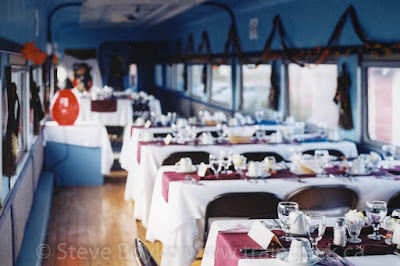 The "Sunset" dining train operated seasonally and provided the largest amount of revenue for the railroad. 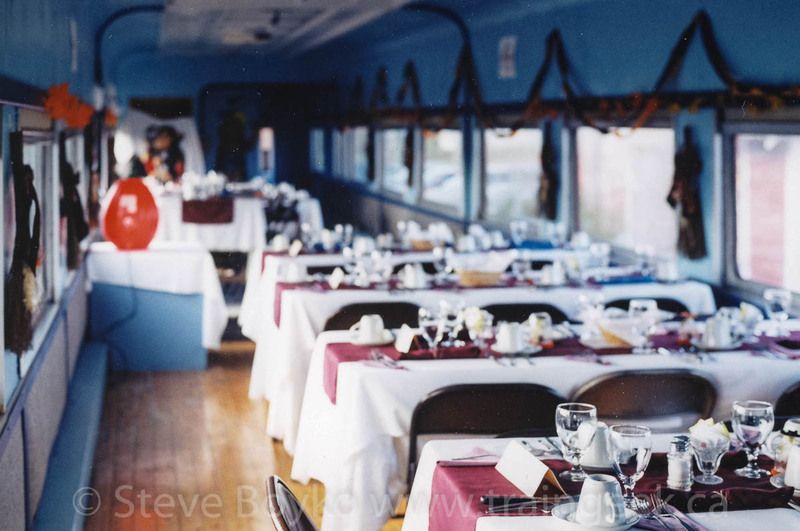 For many years, bus tours, corporate charters, weddings, conventions and other special events used the dining train. On occasion steam locomotive 1009 pulled the train. After 20 years of operation, unfortunately we were faced with increased costs to maintain 11 miles of track along with major pending bridge repairs. 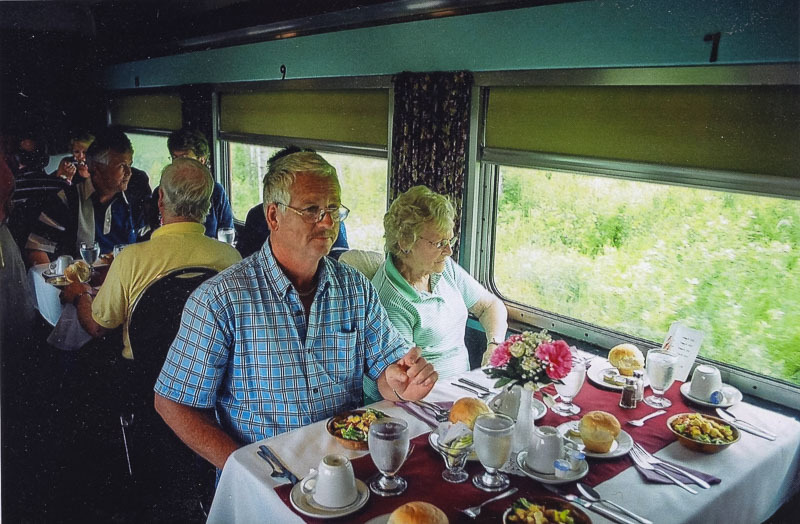 Operating insurance coverage had become harder to secure, and far more expensive, and with less volunteers it was decided to cease operation of both excursion and dinner trains on November 1, 2004. 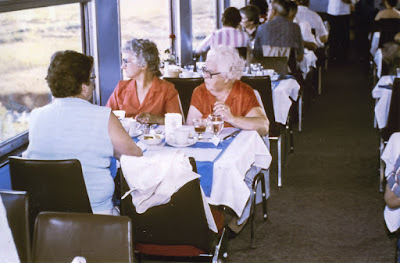 People remember their railway dining experiences for many years. Recently the museum received an email from a retired railroader who rode the Sunset dining train in 1989. He wrote about the experience of having his retirement dinner on the train ("a sumptuous feast of steak and lobster") and he called it "an evening we will never forget". Today we have a large display of railway equipment, several operating model railway layouts and a short rail wagon ride. There are many other smaller exhibits for visitor enjoyment at our museum in Hillsborough. Please visit www.nbrm.ca for more information. 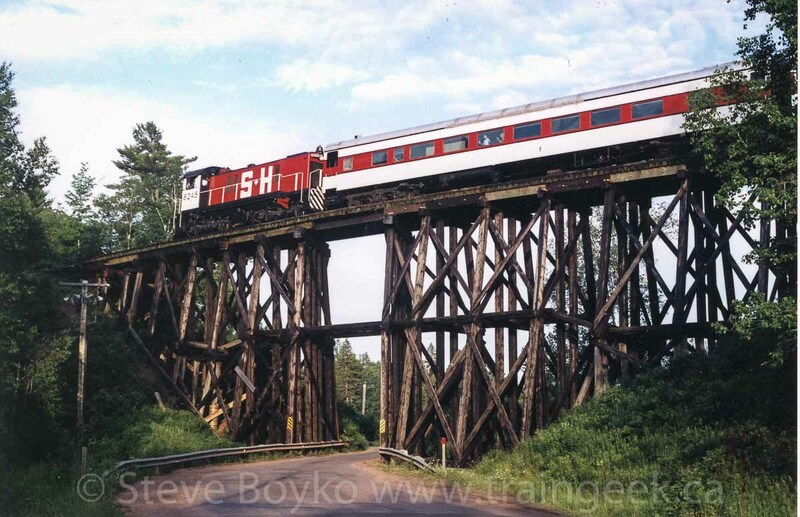 Here's a video I took of the dinner train on October 19, 2002.